Hacker Guccifer 2.0 now claims to have hacked the Clinton Foundation, but the documents posted show Democratic campaign data from organizations already compromised. Guccifer 2.0, believed by some security experts to be a Russian team of hackers, posted several documents Tuesday that he claims to have taken from servers at the Clinton Foundation, the charity founded by former U.S. President Bill Clinton, husband of Democratic presidential candidate Hillary Clinton. Earlier this year, Guccifer 2.0 claimed to have hacked both the Democratic National Committee and the Democratic Congressional Campaign Committee (DCCC), and the new documents appear to be more of the same. "Many of you have been waiting for this, some even asked me to do it," the hacker wrote. "I hacked the Clinton Foundation server and downloaded hundreds of thousands of docs and donors’ databases. Hillary Clinton and her staff don’t even bother about the information security." The Clinton Foundation disputed the breach. 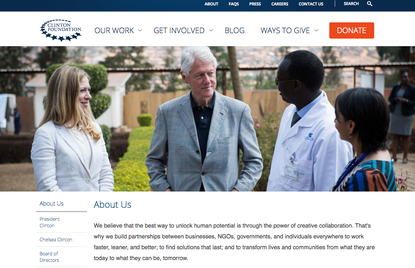 "We still have no evidence Clinton Foundation systems were breached and have not been notified by law enforcement of an issue," it said in a statement. "None of the folders or files shown are from the Clinton Foundation." The new documents include a list of donors and a list of financial industry contributions to U.S. representatives, both Democrats and Republicans. The second document appears to be a couple of years old; it notes contributions to former Representative Barney Frank, a Democrat who left Congress in 2013. The list of folders from the hacked server includes one named DNC, one named DCCC, and one named PAC Fundraisers. A political action committee fundraiser would pertain to politics, not charitable fundraising. Another file leaked is a W-2 tax file for a DCCC employee. Another is a map of targeted congressional races for potential Democratic pickups in the 2016 election. Other files show contributions to the Democratic Party of Virginia.